Marihemp Network Gallery :: 2005 cannabis events. Gallery: Marihemp Network Gallery Album: Cannabis Events Worldwide. Album: Cannabis events worldwide. By year. 1999. 2000, 2001, 2002, 2003, 2004, 2005, 2006, 2007, Photos. Cannabis events, campaigns. 1999. 2000, 2001, 2002, 2003, 2004, 2005, 2006, 2007, 2007 GMM-MMM. Posters, flyers, banners, media. For comments and questions please go to the contact page for the latest email addresses: http://corporatism.tripod.com/webform.htm - You can send in web address URLs for cannabis event photos, posters, flyers, videos, banners, media, etc.. Also, please let the gallery editor know of insulting comments added to images, etc., so that they can be deleted. Album: 2005 cannabis events. Posters, flyers, banners, video ads, etc. 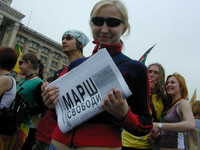 Many of the flyers and banners are for specific cities worldwide. Album: 2005 favorites. Cannabis event images. 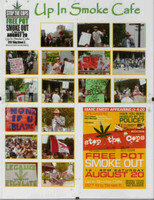 Album: 2005 Global Marijuana March. Photos for many cities. Saturday, May 7, 2005, or that weekend, or thereabouts. Since 1999 hundreds of cities worldwide have signed up for cannabis events of all kinds on the first Saturday in May. 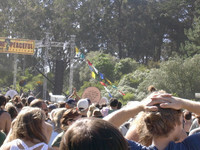 Album: 2005 cannabis-friendly events. Not the focus, though. Album: Amsterdam, Netherlands. June 4, 2005. Legalize it street rave. Album: Denver, Colorado, USA. Nov. 1, 2005 referendum legalizes cannabis. Check out this Russian article and photo about SAFER. Album: Hamilton, Ontario, Canada. August 20. Canabian Day. Album: Sacramento, California, USA. 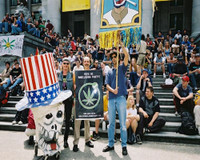 April 9, 2005 medical cannabis rally. Sacramento is the capital city of California. Album: Seattle, Washington, USA. August 20-21, 2005. 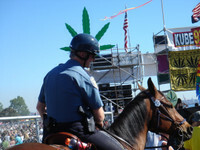 Hempfest. Album: Vancouver, Canada. 420 event at Art Gallery. April 20, 2005. Photos, video link, report links. Over 200 hundred photos in a subfolder in here. Album: Vancouver, British Columbia, Canada. July 1, 2005. Cannabis Day outside the Art Gallery. See the reports and photos in this CC forum thread. Album: Vancouver, Canada. Nov. 10, 2005. Da Kine Cafe rally. Da Kine cannabis cafe rally. "Hash Mob" in front of the the Provincial Court of British Columbia, Canada. See this CC forum thread for info and more photos. See also this Google search. Album: Vancouver rally to free Schapelle Corby. Oct. 18, 2005. Vancouver, British Columbia, Canada. Crowd rallies in front of the Indonesian Consulate in Vancouver's West End. For more info see this CC forum thread. Album: Vancouver. Sept. 3, 2005. Rally to stop the Weed Witch Hunt. At the Vancouver Art Gallery at 750 Hornby Street. Smoke-In protesting women being persecuted around our planet for their association with cannabis, a sacred and healing herb. For more info see this CC forum thread.